Since I’m not really an animal lover I never ran with the dog-fighting story on Michael Vick. I mean, it’s not that I’m not into dogs beating the bag out of each other (huge doggie endorsements), but this story really caught my eye when Michael Vick issued a statement that included him “Finding Jesus.” I think that’s great. I mean no offense, but Jesus has been missing for over 2,000 years. 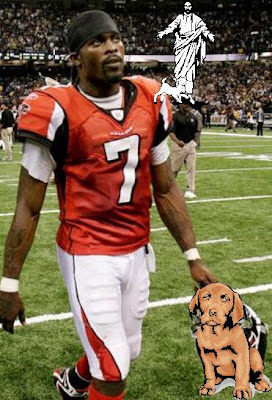 There’s always that promise the He will come back to earth, but what a treat that Michael Vick was the one to find Him. What are the odds? I say Jesus first and then Osama Bin Laden second. Hell, maybe even bring Jesus to help find Bin Laden. I bet He knows where little old Red Riding Laden is. I think it was kind of rude that he didn’t apologize to Snoopy. Rude. Live From a Cave, It's Osama Bin Laden!! One More Arrest and Michael Lohan Gets His 11th Arrest for Free!